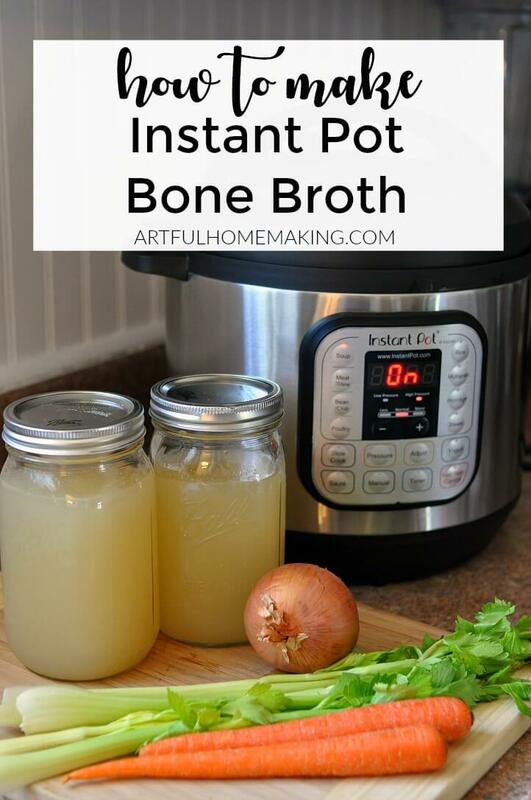 Instant Pot Bone Broth is simple to make and good for you! Here’s how to make chicken stock in the pressure cooker. I’ve been making homemade chicken stock for many years. I started making my own chicken broth way back in my teen years, after receiving a whole foods cookbook for my birthday. Back then I made it in a large stock pot on the stove top. 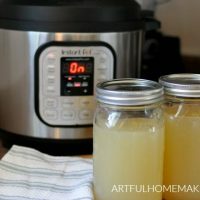 After getting married and becoming a mom, I didn’t have a lot of time, so I learned to make bone broth in my slow cooker. For years, I’ve had a routine down, of cooking a whole chicken one night and then picking the meat off the bones and tossing the bones into my Crock-Pot with some water. Then they cook on low all night and on into the next day. After straining the broth, I like to put it in wide-mouth Mason jars and store it in the freezer. It’s wonderful to have on hand, especially during cold and flu season. After receiving an Instant Pot for Christmas, (I have this one) I was delighted to find that it’s a very convenient way to make bone broth! 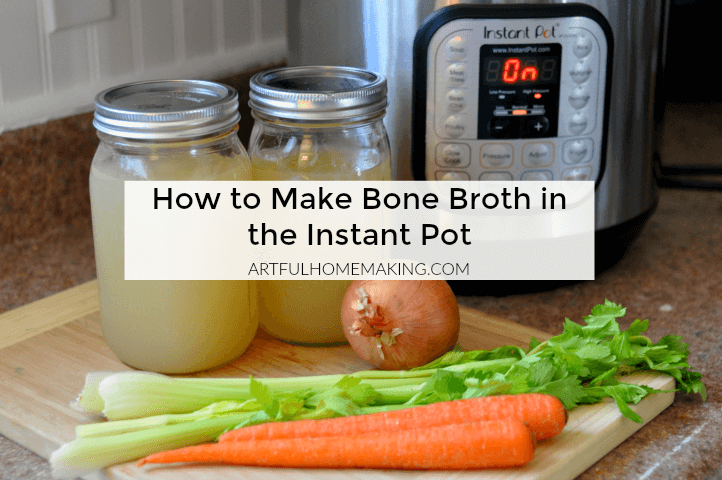 Making Instant Pot bone broth couldn’t be simpler. 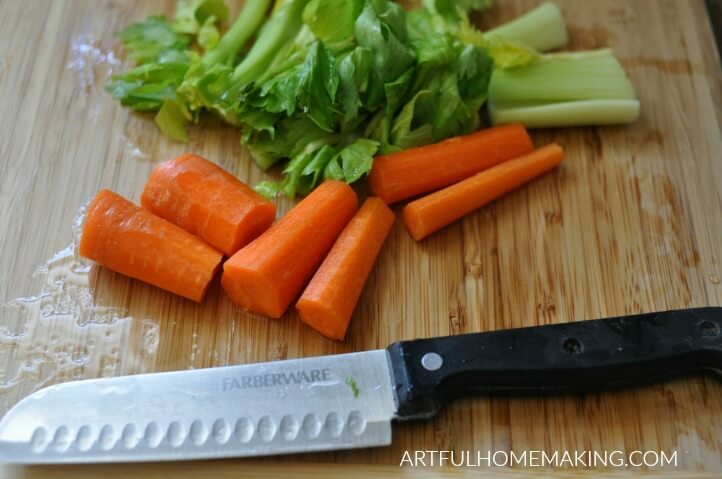 After adding the bones to the pot, I sometimes add carrots, celery, and onion if I have them available. I like to keep a bag in the freezer for storing celery tops and other odds and ends that work well for bone broth. Put the bones in the Instant Pot. Add the vegetables, vinegar, salt, and about 8-10 peppercorns. Cover the bones with water until the pot is about 3/4 full. Put the lid on the Instant Pot and set the valve to “sealing”. Press the “soup” button on the Instant Pot. Set the pressure to “low, and increase the cooking time to 120 minutes. After the two hours are up, you can either end the cooking cycle there, or repeat the cycle a second time. Allow the pressure to naturally release. Allow the broth to cool, strain, and pour into quart jars to store in the fridge or freezer (or you can also use it to make soup that night!). My favorite thing to do with my broth is to freeze it. I love having jars filled with homemade chicken broth in my freezer. The key to not having cracked jars in the freezer is to make sure you use wide-mouth jars and to be sure to leave about 2 inches of head space at the top to allow for expansion. 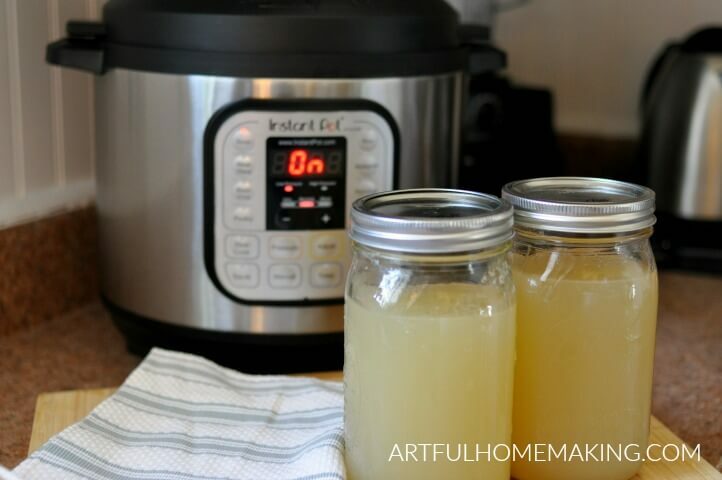 Homemade chicken broth is simple to make when you use the Instant Pot pressure cooker! Put the bones in the Instant Pot. Add the vegetables, vinegar, salt, and about 8-10 peppercorns. Cover the bones with water until the pot is about 3/4 full. Put the lid on the Instant Pot and set the valve to "sealing". Press the "soup" button on the Instant Pot. Set the pressure to "low," and increase the cooking time to 120 minutes. Allow the pressure to naturally release. 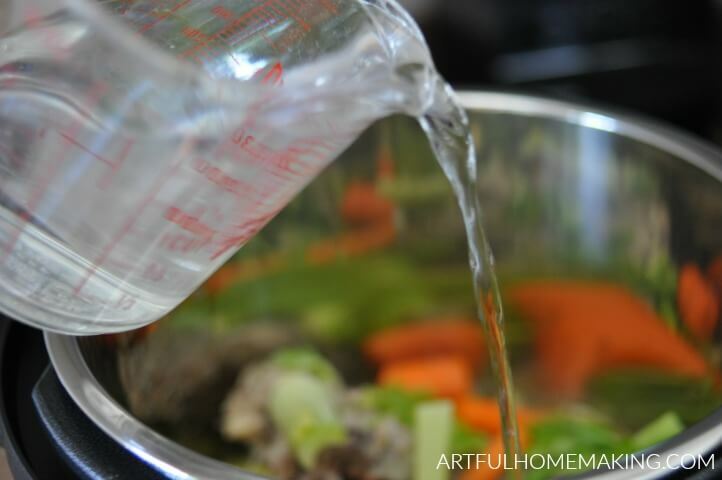 Allow the broth to cool, strain, and pour into jars to store in the fridge or freezer. 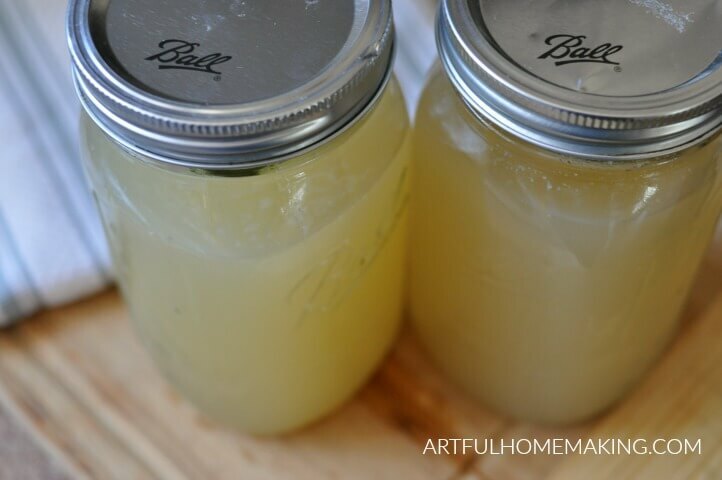 If you decide to freeze your broth, be sure to use wide-mouth jars and leave about 2" of head space at the top to give the broth room to expand (this way you will be less likely to end up with cracked jars in the freezer!). Bone broth is soo good for you!! I’ve done several bone broth fasts. Making it at home is a labor-intensive process. I need one of these instant pots! Lol! I usually use the slow cooker, like you mentioned. Thank you for linking up with us @LiveLifeWell. Man I love a good chicken bone broth! There is nothing better than pulling that out and making some homemade Chicken Noodle Soup! Thank you for the recipe! I have not purchased one of these yet, but I must be the last person on the planet without one. LOL I keep toying with the idea, especially when I see so many great recipes. You aren’t that last one on the planet to get an instant pot, I share the spot with you! I have only heard about it recently. Right now I am a Great-grandma, my first great-grandson was born on the 5th of April. I also have been raising two of my youngest grandchildren. Which we adopted several years ago. So I am doing the Mommy thing all over again. I love these kind of websites. We have switched our whole way of eating for health reasons. Bone broths were once the norm and people got away from them but things are trending back to old fashioned wholesomeness. Glad to see it. Refreshing to see young mothers following the steps of their grandmothers. Hope to research the Instant Pot too see if it something I can use. It took me awhile to warm up to the idea of the Instant Pot (I wasn’t sure I needed another kitchen gadget! ), but it’s been a big help to me, and now I love it! 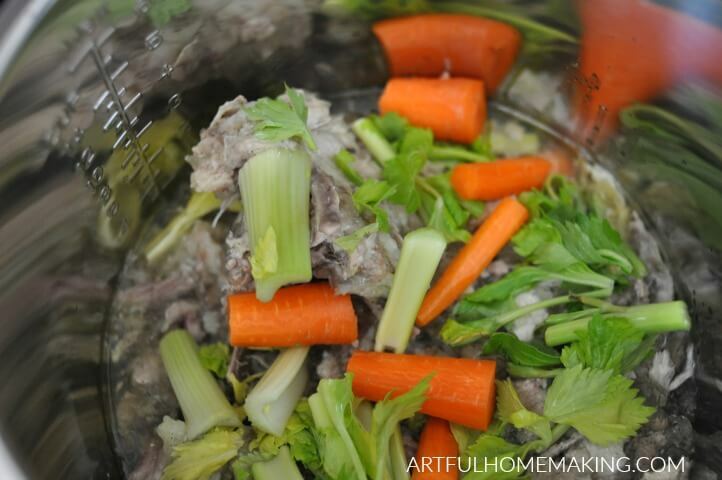 Homemade broths are such classics but for busy people like me, Au Bon Broth is the best! You can easily prepare a cup of broth, drink it while commuting for work or when you’re on a coffee break at the office. I agree, it’s a great healthy drink for busy people!